Get ready to walk alongside a large-scale balloon and sound installation, wonder at 1000 hoops suspended in the Cathedral, contribute your ideas to Imagineer’s next large-scale project, board a custom-converted double decker bus which turns the whole city into a stage, gasp as dance meets circus on top of giant blocks before playing the streets in a Festival Finale that invites everyone to come and play. Throughout the week Imagineer are inviting communities to get involved with the creative development of Bridge, Imagineer’s latest large-scale commission led by artistic director Orit Azaz, designer Dan Potra and choreographer Corey Baker and developed in partnership with engineers from Arup. During the Festival the team will share emerging ideas through creative conversations, performance-based activities and experiments, story gathering and virtual reality presentations. All communities are invited to come along and contribute to the creative development of the project. Imagineer also invites communities, artists and designers to join the co-founder of Burning Man Harley K. Dubois, in a one-off talk outlining Burning Man’s secret mission to change the world and to invite the audience to consider how this creativity can be brought to Coventry. Chenine Bhathena, Creative Director of the Coventry City of Culture Trust, said: “The Festival of Imagineers is a regular feature on the Coventry culture map. It’s great to see such a mix of brilliant artists bringing their ideas and imagination to the city. 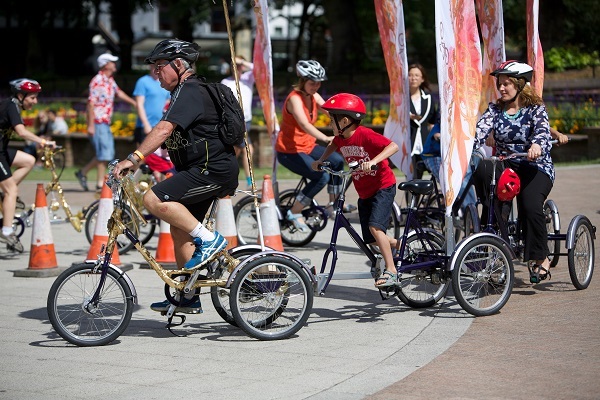 As part of the Play the Streets programme on Saturday 22 September hop on an Imagineer trike and join Coventry University’s community open day tours celebrating the University’s 175th year of teaching in the city. The unusual and entertaining tour will take in the University’s science and health building and Harrier Jet as well as opening the doors to the University’s mock crime scene and court room. Vice-chancellor John Latham from Coventry University said: “We’re delighted to be part of the festival and to be celebrating the shared passions we as a university have with all the talented people involved, whether from a creative arts or engineering perspective. Play the Streets from 12noon until 4pm promises fun, family-friendly activities – all free – including action painting, hula workshops as well as a special trip into space in the Astronauts Caravan! All activities are centred around University Square with amazing exhibitions and structures to visit at The Herbert and Coventry Cathedral. Tickets are still available for the stunning NoFit State Circus and Motionhouse collaboration BLOCK, a fusion of dance and circus that pushes the limits of both art forms, BLOCK explores what happens when dance and circus collide. Twenty oversized blocks, fashioned to resemble giant concrete Jenga blocks, are deconstructed and reformed into an infinite variety of shapes for the performers to play on, move with and explore. BLOCK runs on 19 September only at 8pm in the Cathedral Ruins. Tickets cost £10/(£7 Conc) and can be booked via the website. With performances from Thursday 20 until Saturday 22 September, don’t miss out on tickets for Rear View from IOU, a unique interactive experience for all audiences where the streets of Coventry become part of the performance with the audience on a custom-made conversion of a double decker bus, a mobile auditorium which turns the City into a stage. On board the Rear View bus, audiences wear positional sound headphones for a totally immersive experience, listening to the audio in real time with an imaginary soundscape blurring the line between fantasy and reality. Tickets cost £7 (£5 Conc) and can be booked via the website. The Festival culminates on 22 September in a celebration of Imagineer’s twenty-year collaboration with outdoor arts company, Teatr Biuro Podrozy marking the WWI commemorations with Carmen Funebre, the company’s most iconic performance which has toured almost 50 countries world-wide. Performed in the Cathedral Ruins expect stilts, fire, searchlights, spectacular sets and bone-chilling music combine with arresting visual imagery to evoke both fear and compassion. Tickets cost £10/(£7 Conc) and can be booked via the website. Festival of Imagineers is supported by Arts Council England, Coventry University, Great Places, The Paul Hamlyn Foundation, City of Culture 2021, Arup, Medwell Hyde, IDP, The Garfield Weston Foundation, The Premier Group, Ramada, Coventry BID and Wigleys.